Keion Davis gets ready to return one of his two kick off return touchdowns against Miami (Ohio). Following his two kickoff return touchdowns and his 196 kickoff return yards, Davis was named Conference USA Special Teams Player of the Week. Marshall football’s 2017 season shot off like a cannon Saturday night with a 99-yard kickoff return for a touchdown from redshirt junior Keion Davis. The Thundering Herd could not have blocked any better on the opening kickoff, quite honestly. Once Davis got to the 25-yard line, there was no one left in his way to prevent him from getting into the end zone. “I have to give credit to Marcel Williams, because he stuck his nose in on that play and made a great block, which set up the return,” Davis said. The Herd won the opening coin toss and elected to receive, which put Davis in position to make that opening play of the game –— last season Marshall chose to defer until the second half when winning the coin toss. The Fairburn, Georgia native was not done there, as he’d find his way into the end zone a second time late in the second quarter. Marshall held just a one-point lead, 14-13, with 3:15 remaining in the first half after its defense held its own just outside the RedHawks red zone and conceded a 42-yard field goal from Sam Sloman. Then it was rinse and repeat for Davis, this time coming in the form of a 97-yard kickoff return for a score. “We practice on that every day and make sure that everybody knows their job on the play, and executed it during the game,” redshirt freshman Willie Johnson said about Davis’ two scoring kick returns. With the second return for a touchdown, Davis opened a spot in the history books for his name. 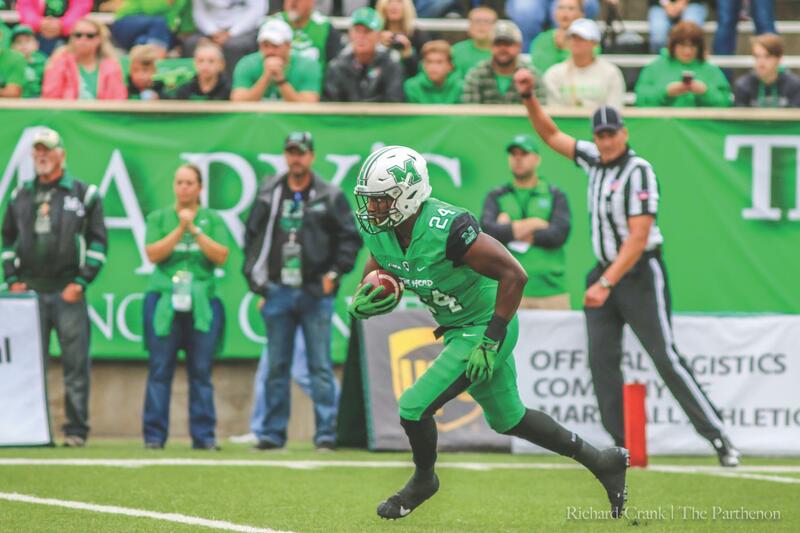 Davis became the first player in Marshall history and the 21st player in NCAA history with two kickoff returns for a touchdown in the same game. There have been seven kickoff returns of 97 yards or longer in Herd football history and Davis is now responsible for three of them. Keion Davis during the pregame warm up locking himself in for the season opening game for the Herd. Davis earned one of two team game balls for his week one performance. The other game ball was given to the programs strength and conditioning staff. 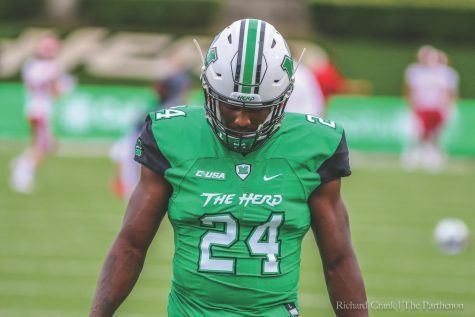 He also took one back 99 yards for a touchdown last season against North Texas to start the second half, a game the Herd ultimately lost 38-21 at home. The one bad decision Holliday spoke of was when Davis attempted to field the kickoff and ultimately was forced out of bounds at the Herd’s two-yard line. However, Marshall was able to score on that drive with a 22-yard touchdown pass from Chase Litton to Tyre Brady. Davis’ 196 kick return yards in the Herd’s 31-26 win over Miami (Ohio) was the third-highest single-game total in program history. The program mark belongs to recent-graduate Deandre Reaves, who broke the record with 221 kick return yards on Nov. 27, 2015 in a 49-28 loss at Western Kentucky. The previous high was 208 yards set by Darius Marshall in a Sept. 27, 2008 loss to West Virginia in Morgantown. Davis and the Thundering Herd now turn their attention to the first road game of the year in Raleigh, North Carolina against the NC State Wolfpack with a 6 p.m. ET kickoff.